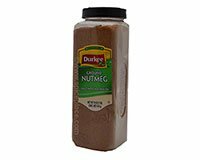 Durkee Gound Nutmeg is made by grinding the hard seed of the fruit of an evergreen tree native to the Spice Islands. It has a warm, spicy and sweet flavor. Although nutmeg can be used on many foods, it is most popular as a baking spice. Often used in cookies, cakes, quick breads, and custard. Add a dash to mashed potatoes or spinach. Five Spice Mustard More Recipes..